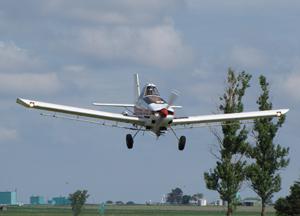 Two crop-dusting planes crashed Tuesday in separate incidents in Iowa, taking the total to seven aerial applicators crashing this year statewide. There were six crashes of ag aviation planes in all of last year, according to Tim McClung, planning and outreach manager for the Iowa D.O.T.’s Office of Aviation. He says that works out to about 26,000 annual missions. While we’ll sometimes see vintage biplanes buzzing over the rows of corn and soybeans, McClung says plenty of new crop-spraying planes are being built. He says 86% of the airports in Iowa support agricultural aviation and there are about 50 Iowa-based crop dusters, in addition to another 140 or so operators who fly in from out of state for the seasonal work. McClung says it takes a lot of work for those planes to cover four-million acres of cropland. He says, “Over the past several years, the number of acres applied has increased due to particularly spraying for aphids on soybeans and spraying fungicides for corn.” McClung says it’s often simply not practical for a farmer to try and cover his crop with these chemicals from the ground. “It’s really a matter of time,” he says. “When crops need to be treated, they need to be treated quickly and ag aviation is a way to treat a lot of acres in a very short period of time.” Iowa first began seeing aerial application of chemicals to crops in 1947. Today, ag aviators will typically charge farmers $15 an acre to spray for aphids on soybeans and perhaps $25 per acre to drop fungicide on corn.